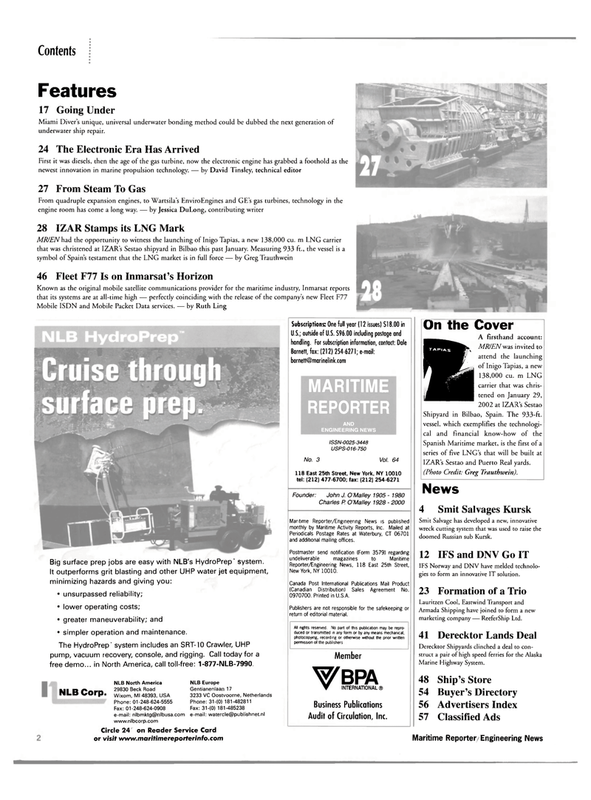 Big surface prep jobs are easy with NLB's HydroPrep" system. The HydroPrep" system includes an SRT-10 Crawler, UHP pump, vacuum recovery, console, and rigging. Call today for a free demo... in North America, call toll-free: 1-877-NLB-7990. Periodicals Postage Rates at Waterbury, CT 06701 and additional mailing offices. Canada Post International Publications Mail Product (Canadian Distribution) Sales Agreement No. 0970700. Printed in U.S.A.
Publishers are not responsible for the safekeeping or return of editorial material. IZAR's Sestao and Puerto Real yards. (Photo Credit: Greg Trauthwein).